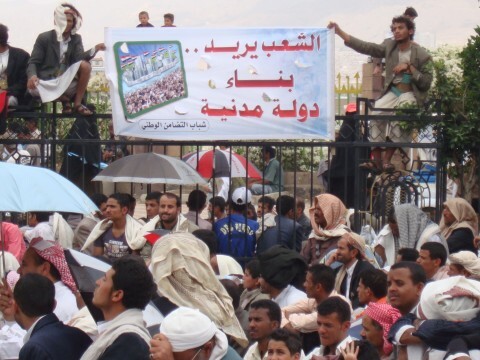 When Sanaa's Change Square became the focal point for Yemeni pro-democracy protests in 2011, one of the first posters to appear called the demonstrations there the "first step towards our civil state". It was remarkable to find such a poster in a country that has always been known for its socio-tribal form of power structure. But that was a period of hope; Change Square was transformed into a collective of tents housing hundreds of activists. Today, however, after two years as a habitat for protesters, the square has been cleared. And a civil state, the ideal once championed in the square, remains little more than a hope that is beyond reach. Before 2011, the square was just a regular large traffic space in front of Yemen's new Sanaa University campus. No one imagined that it would become significant in one of Yemen's historic and political milestones. But Change Square became a heavily politicised space. As independent revolutionaries progressively lost influence with the main political opposition, they came to own the square. But as time went on, the independent change advocates could only watch as other, more influential political powers hijacked the square and, eventually, the uprising that it symbolised. Last month, after President Abdrabu Mansur Hadi's decrees reshuffling the country's military structure, the Change Square Organising Committee - which is now affiliated with Yemen's opposition alliance, the Joint Meeting Parties (JMP) - announced that protesters' tents would be cleared and that the weekly Friday prayers would cease. Some of the oldest tents in the square belonged to Yemen's Muslim Brotherhood, to members of Al Islah political party, and to Nobel Peace Prize laureate Tawakkol Karman. She summoned reporters to a press conference about three weeks ago to declare that she was removing her tent and that she endorsed the whole move by the organisational committee. "It's time to move to the next goal of the uprising, now that the restructuring of the army has been accomplished," she said. "Now our focus will shift towards monitoring and addressing corruption in governmental institutions across the country." Despite Ms Karman's stature, the dynamics of the change in Change Square are suspect. One of the square's core activists, Rathwan Al Haimi, thinks that the decision to evacuate the square did not represent what the uprising stands for. The decision, he says, "was a result of an accord between the First Armoured Division and the JMP who long ago hijacked the revolution and transformed it into a mere political crisis. We independent youth revolutionaries had no say on this whatsoever". Further, Al Islah, which is very prominent in the opposition now, has had a big role in all the major developments in the square, largely because it has great financial capacity. Primacy in the square went to those with the most political and financial power, but then a new need emerged - to provide medical treatment to the hundreds who were injured in the 2011 protests against the new "consensus" government. The demand for medical care was met, after a fashion, but there were indications of preferential - not to say corrupt - distribution of aid. Dozens of protesters continued to suffer, with severe physical injuries untreated. Now the square is empty, and whatever momentum existed there has been dissipated. Blogger and political activist Fatima Al Aghbri laments the evacuation of the square: "How can we say the revolution succeeded and simply abandon the square while there is so much to be done? They are killing the revolution slowly. "It's sad that the uprising has not succeeded yet," she continues. "Prisons are still full of political prisoners. Wounded protesters have not all been treated. Youth's voice is still marginalised. Half of the current government consists of remnants of the old regime. Opposition parties have been assigned to rule and have allowed immunity to murderers. I can't see any success achieved." One young revolutionary, Waleed Al Amari, believes that only a new method can improve the situation. "The political system must focus on building valid institutions based on justice and competence." Mr Saleh, he says, kept the country divided for three decades, to rule it. Change Square was the seed of Yemen's uprising and the momentum built up there was a driving influence behind the changes of the past two years. The scene in the square was extremely politicised and polarised, but it gave birth to a wonderful and outspoken political movement of people who are determined to continue the revolutionary work that they started. "Just because the square was evacuated that doesn't mean we'll quit our political activism. The revolution lies within us," says Mr Al Junid. Despite such determination, the challenges are still enormous for those still dreaming of a civil state for Yemen.